Proteoglycans (PGs) and glycosaminoglycans (GAGs) have long been recognized as constituents of heart valves but their precise functions have been mysterious and underrepresented. The heterogeneity, dynamic processing and viscoelastic nature of PGs and GAGs, and their ability to exist independently or in association with other extracellular matrix (ECM) components, contribute to the overall complexity of valve ECM (structure), and impact local tissue biomechanics (function). 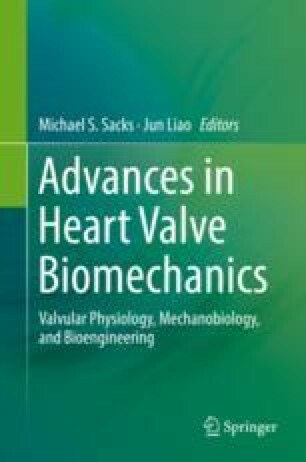 This chapter will discuss various approaches for elucidating the biomechanical properties of valvular PGs and GAGs, will relate valve tissue hemodynamic alterations and valve cell biomechanical stimuli to differences in PG/GAG expression (and misexpression), and will address directions for future studies. The authors would like to thanks Dr. Jennifer Petsche Connell and Andy Zhang for assistance in the preparation of this chapter.